When you hire a professional to install outdoor lighting on your Morris County, NJ property, you are improving the functionality of your outdoor living and entertaining areas, making your property safer and adding to its curb appeal — all of which will increase the resale value of your home. The money you spend on adding outdoor lighting around your property will yield a substantial return on your investment, so you can’t go wrong. This property uses lighting to create the illusion of sitting on a waterside dock once the sun goes down. The most striking feature of this design is the use of LED lights under the stone steps. 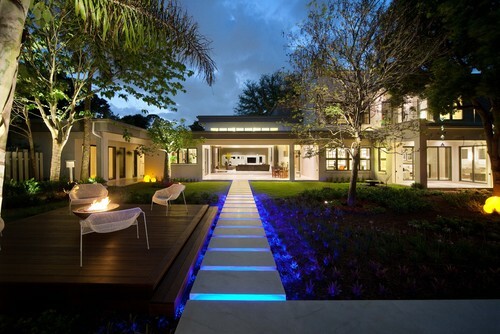 The blue LED lights illuminate the walkway to enhance safety, but it’s impossible not to notice the dramatic impact of the lighting and the warmth it adds to the entire garden area. The blue light reflects off the succulents planted nearby to simulate the look of a shining pool of water. The raised steps are an excellent solution for low, boggy spots, but this effect is so charming you may wish to add it to any spot in your backyard; after all, it’s a creative way to connect the house to its surroundings with light. This pool is bordered by a terraced garden that solves the issue of a sloping lot on the property. Smart lighting design enhances the multi-level look of the pool’s landscape design, which features textured natural stone. Using LED lights in the retaining walls guides people to the pool and enhances the ambiance of this beautiful recreational area. Uplighting brightens the area while highlighting the delicate leaves and blossoms on the trees. All of the lighting works wonderfully together, and the pool area becomes an inviting place for nighttime relaxation while providing safe illumination for night swimming. This home has raised planting beds that frame a patio and define its lines. But the definition of those lines wouldn’t be visible after dark, so rope lights highlight the curves while ensuring that people don’t accidentally step into the raised beds. Contrasting blue lights illuminate the doorway and lines of the house so people know where to locate the entrance and exit to the building. Using LED lights in retaining walls defines the functional areas for dining and cooking on the patio. 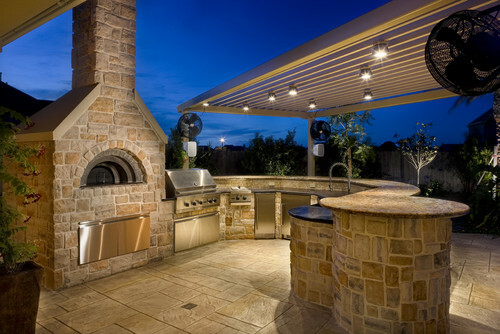 When you have a full outdoor kitchen and adjacent living space, you have the perfect outdoor entertainment area — but you can’t really get the most out of it unless you have sufficient lighting. You couldn’t cook in your indoor kitchen without adequate light, so your outdoor kitchen is no different in that respect. Overhead lights built into a permanent roof provide bright task lights over kitchen counters, and a wash of general light highlights the natural stone fireplace and patio pavers. This photo shows you how homeowners of a modern home transformed their patio into an extension of their indoor living space. There is even a nearby fireplace. The lighting used here creates an ambiance that makes people want to congregate since it uses a soft wash of light instead of focused task lighting. 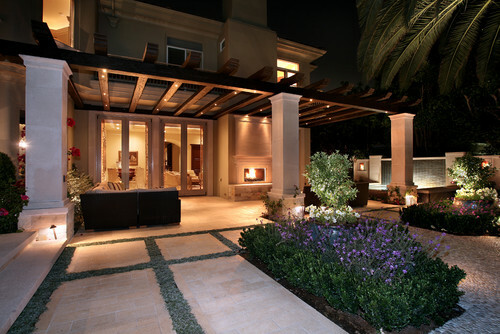 This property features a California pergola, but you could adopt a similar lighting scheme under a permanent roof structure to create a suitable outdoor lighting plan in Morris County, NJ. A huge tree that has an especially interesting shape or unusual trunk formation can be an interesting addition to your landscape, but after dusk, the darkness of the night hides it. Uplighting, silhouetting or using a simple spotlight are all ways to create a dramatic impact when your tree has a unique branch structure. 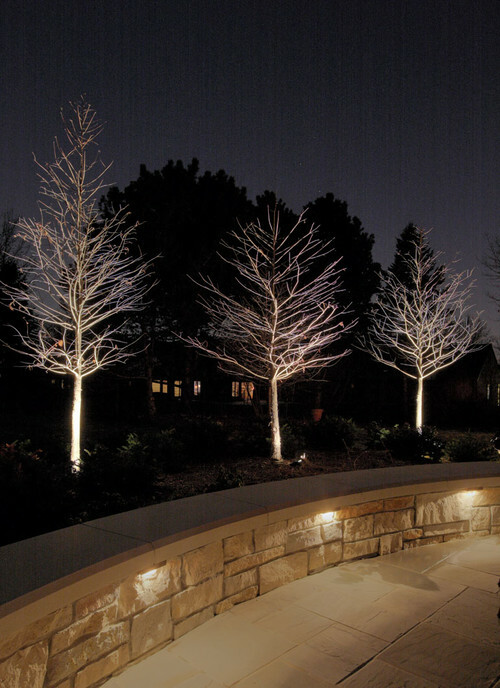 Professional landscape lighting works to create beautiful effects in addition to simply illuminating outdoor rooms for nighttime use. Outdoor lighting is just one part of the landscaping design process that transforms the outdoor areas on your property into a safe, inviting and energy-efficient extension of your indoor living areas. An outdoor lighting expert will work with you to help you choose the options best suited to each area of your property, including walkways, patios, outdoor kitchens, pool areas and more. Once the design is complete, professional lighting and electrical installation technicians step in. They have the necessary training and certification to install wiring for every outdoor feature or area that requires electricity. This is crucial to ensure your new landscape is up to code and passes inspection. Lighting is a special art because it’s not something you can touch. This makes it one of the trickiest design aspects to get right. 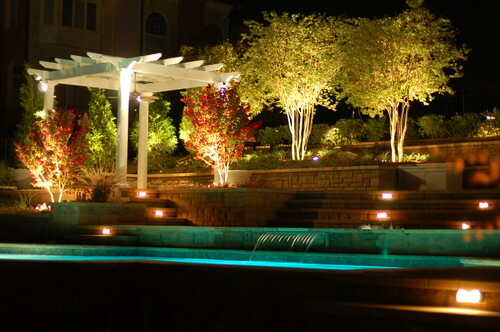 The best landscape lighting contractors coordinate their efforts with landscape designers and architects to create a look that attracts attention, increases property value and enhances the safety of every part of your property. 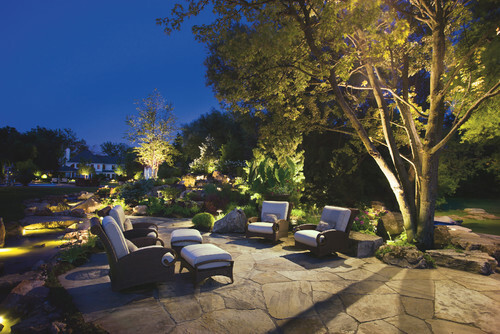 Landscaping pros can envision the way the right lighting will do all of these things, and they’ll explain their work every step of the way, so you get exactly the look you want — day or night.